On Saturn, the sixth planet from the sun, wind speeds can reach 400 meters (about 1300 feet) per second, and always go in the west-east direction. To put that into perspective, even the strongest hurricanes on Earth have never had winds which exceeded 100 meters (about 300 feet) per second and winds can go in all directions. Liming Li, associate professor of physics. A recent three-year, $523,190 grant from NASA will fund research to answer this question. Using data from the Cassini mission, Li and his research team will compile data on wind speeds and planet temperatures, in order to piece together a better understanding of Saturn’s winds. Launched in 1997, the Cassini spacecraft reached Saturn in 2004, where it spent 13 years in orbit around the planet. With one Saturn year – one full rotation around the Sun – lasting about 30 Earth years, this time span was long enough to collect seasonal information. This includes variability in wind speeds. 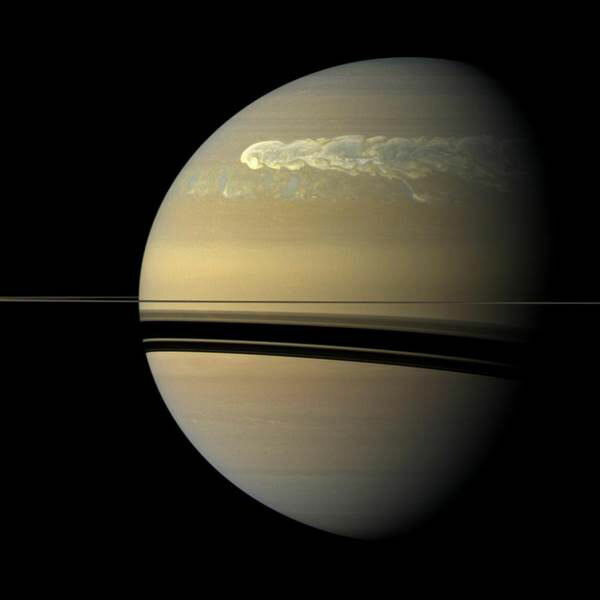 True-color image of Saturn’s greatest storm. The image was taken on February 2011, about 12 weeks after the eruption of the storm. The storm erupted as a roughly circular pattern, but the strong Saturn’s winds in the west-east direction stretched it into a linear shape. 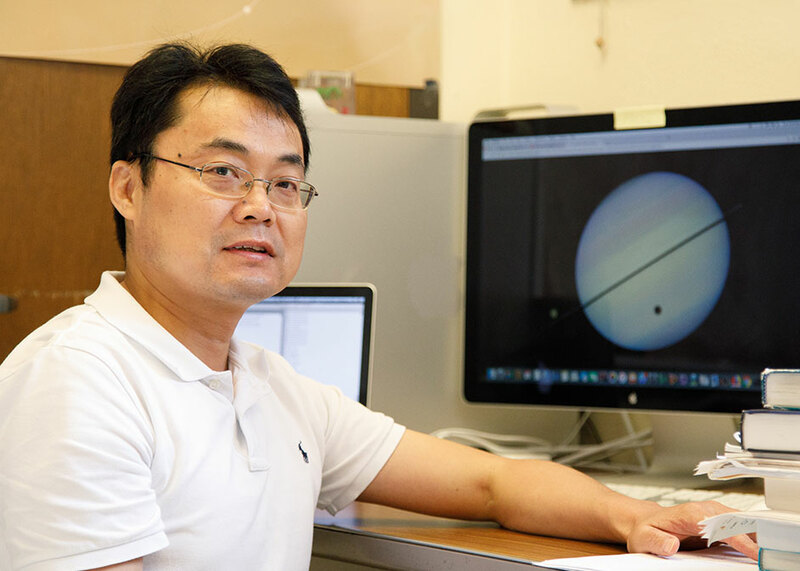 To study Saturn’s winds, Li and his research team will use data collected by three separate instruments: a visible camera, an infrared spectrometer, and a combined visible/infrared spectrometer. The first two instruments offer higher resolutions, while the third instrument offers simultaneous visible and infrared information. The infrared images collected from Saturn offer the opportunity to probe deeper layers of Saturn’s atmosphere, beyond what is available from visible images. These three instruments will offer complementary information about weather patterns on Saturn. Based on photo images, Li can calculate wind directions by examining the position of clouds and the rate at which these clouds move. This can yield information about wind patterns – hurricanes, wind vortices, as well as how wind speeds vary over time. Infrared data can also help infer temperatures on Saturn. “If one area is hot, then air will rise,” Li said. “That means there is a relationship between temperature and motion. If we know the temperature, we can calculate wind speeds.” This in turn can lend insight about the strength, speed and patterns of Saturn’s winds. “This analysis will help us understand the physics of wind on giant planets, such as Saturn,” Li said.